The puritans may argue that idli and vafole are not interchangeable. However, for all practical purposes, I think that idli batter does the job beautifully. In the days of yore, when everything was made from scratch, I would watch in fascination as the ingredients, were soaked, pounded and left to ferment. The coconut chutney was hand ground on a special stone called ‘paata-varvanta’ till it was the texture of fine velvet. Aji didn’t think that mixer-grinders could do the job as well and that the heat from the appliance would ruin the taste of the chutney, which had to be just so. Sadly, for us creatures of the modern conveniences era, a food processor/ mixer-grinder will have to do, although I am still envious of those who enjoy the luxury of being able to do this the old fashioned way. 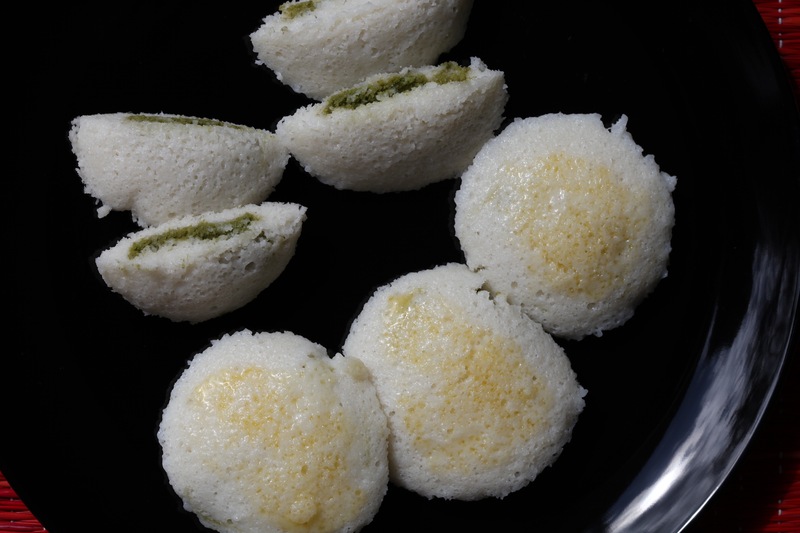 Whichever way you choose to make these vafole or stuffed idlis, no one can argue that they make a perfect snack. Hot, stuffed with a spicy filling (chutney, potatoes, mince – the choices are many) and a smooth texture that allows your taste buds to lull you senses into a general feeling of ‘all’s well with the world’. Add a cup of steaming coffee and I’m in food heaven. 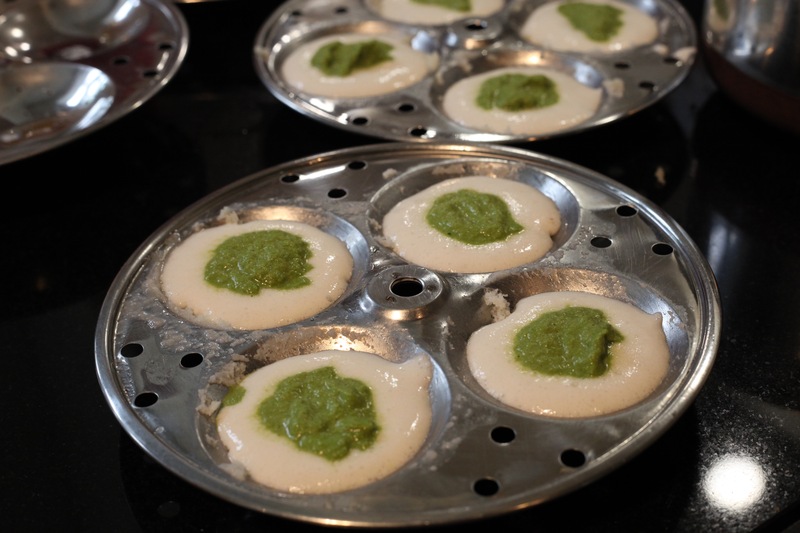 You can choose to use a traditional idli stand or you can use metal muffin trays that can withstand the steaming process. Grease the moulds lightly with the oil. Fill the moulds with the batter to the half way mark. Add a table spoon of the chutney (or potatoes/mince). Top with batter so that you mould is full but still has a little breathing space for the mixture to rise. Steam for about 10-12 minutes until the vafole are cooked through and fluffy. Run a blunt knife around the base of the vafoles to release them from the moulds. Top with some ghee (optional) and serve hot. Try and use up the vafole on the same day. They don’t heat very well and the microwave destroys the chutney, in this case. This entry was posted in A-Z 2016, Savoury snacks, Teatime snacks or Brunch ideas and tagged #AtoZchallenge, brunch ideas, Chutney, coconut chutney, epicurious, gluten free brunch, Mumsnet Blogging Network, stuffed idlis, vafole, Yummly. Bookmark the permalink. Thanks. 🙂 The original is stuffed with mince but I’ve modified this to make it vegetarian.